First traveled by European explorers in 1791, the swift, navigable channel between Fidalgo and Guemes islands has long been the heart of the Anacortes working waterfront. 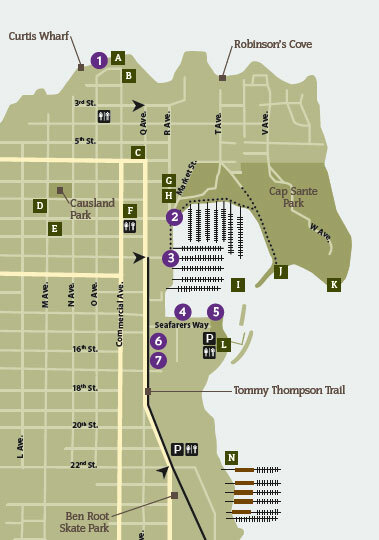 Since its days as an insular port city, Anacortes has loved a party. When there were no roads to connect early settlers, they convened by boat for balls and midnight suppers. Holidays have long filled the streets of the historic downtown. Dungeness crab, found in commercial quantities from Alaska to central California, is one of the most popular items on West Coast dinner tables. Anacortes traces its local crabbing traditions to Coast Salish subsistence harvesting. For both work and play, the bays, beaches, and surrounding islands of the Salish Sea are integral to life on Fidalgo Island. Early settlers made their own fun, canoeing and rowing on lakes and bays, swimming in brisk ocean waters, and boating to nearby islands. For almost a century, commercial fishing was a mainstay of the Anacortes economy. In the 1950s, the Puget Sound fishing fleet packed the marina stem to stern, enjoying the city's amenities and its convenient access to island and Alaskan waters. The prominent rocky headland across the marina is perhaps the most notable—and enduring—feature of Fidalgo Bay, claiming a special place in local geologic and cultural history. 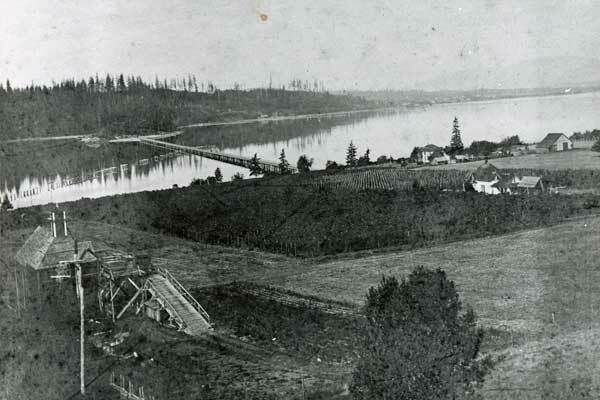 Abundant supplies of local timber gave rise to Anacortes' first industry—wood processing. 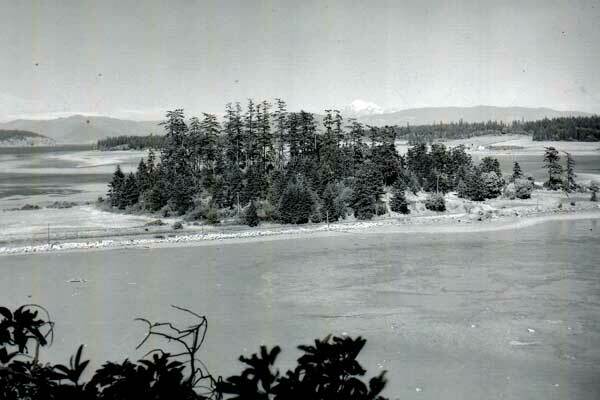 By the early 1900s, 13 plants lined "Mill Row" along Fidalgo Bay's western shore. Spurred by the Oregon Land Donation Act of 1850, pioneer settlers moved west. A little over a century ago, old-growth forests of massive firs and cedars covered much of the Pacific Northwest. 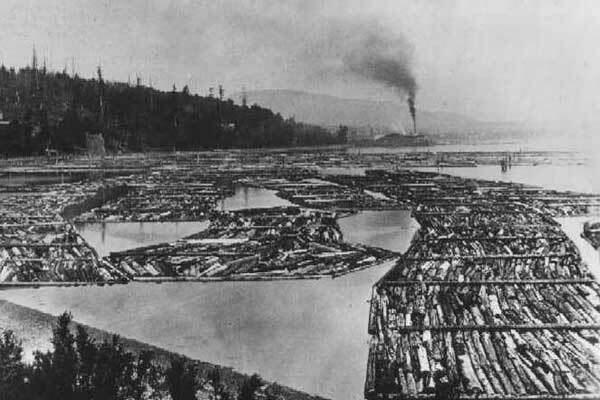 Skagit Valley pioneers discovered a vast expanse of densely growing timber. 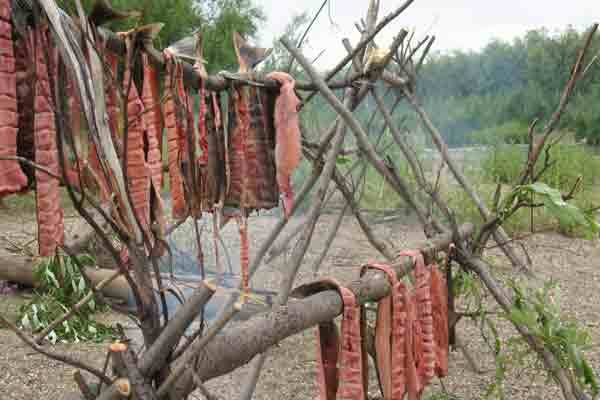 The shoreline of the Salish Sea is blessed with an abundance of natural riches. A nursery of broad tidal flats and marshes is flushed by nutrientrich salty and fresh waters, bordered by fertile uplands, and draped in a gentle climate.